Hi Guys! Hope that you had a great weekend! We have been so busy in life, it is almost painful (I am sure everyone can relate.) So I look forward to the weekend so much, and then I get overly excited and try to cram in everything in those two weeks and then I am more exhausted at the end of the weekend then I ever was on Friday. I have to remember to try and save Sundays for being totally couch bound so that I am not so tired come Monday morning. It might be a good idea to remember not to drink too much too! Headaches don’t make anything easier! Whish leads me to the fact that I have been doing Whole30, although I think it could more accurately be called “mostly whole30.” I was perfect until Saturday night, when I ate sushi with rice, soy products and a bunch of sake. Oops. But I was back on the wagon this morning and am really determined to stay on the wagon this week! 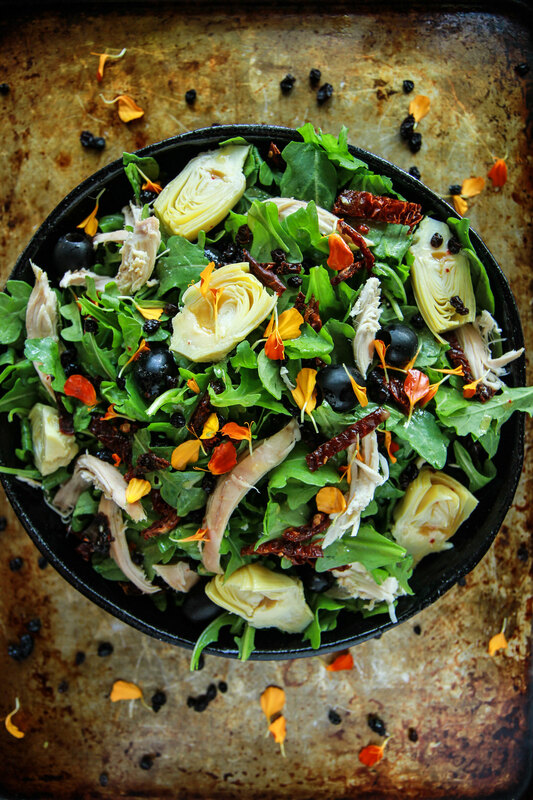 This delicious Sicilian Chicken Arugula Salad is one of the ways I am sticking to the program! It’s healthy, filling and SO jam packed with vibrant flavors that you forget about what you are not eating and focus on the deliciousness at hand! What are your favorite Whole30 dishes? I need some dinner inspiration for the week! 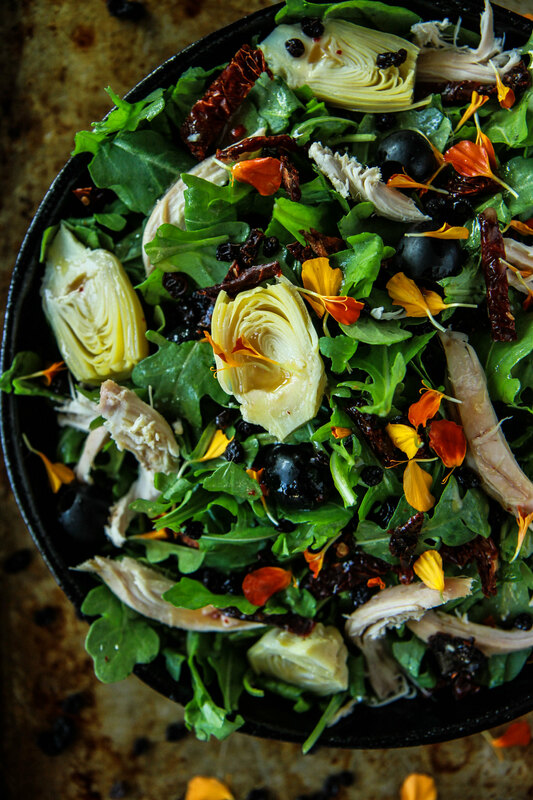 Arrange the arugula, chicken, sundried tomatoes, artichoke hearts, olives and currants in a large bowl or on a platter. In a small bowl, whisk together the dressing and season with kosher salt to taste. Drizzle the dressing over the salad and toss to coat then serve immediately. How could you resist sushi rolls? Lol. This salad looks perfect for a Monday reset! Hope you get to relax a bit!